Presented here, a wonderful Pastel Still Life. The detail is incredible and the subject matter mouth-watering. The painting is framed in a lemon gold frame and still retains the bubbly old glass. It has a certain charm . . . beautifully executed, yet with a naiveness about it that really shows the skill of the artist. 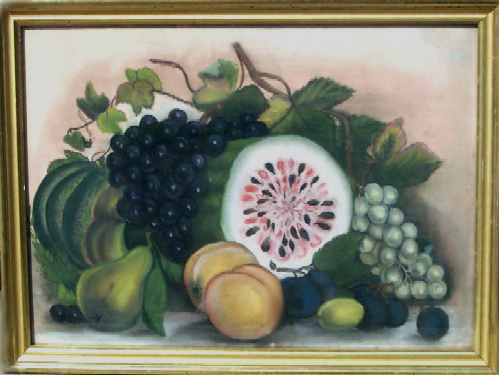 Much of the time Still Life Paintings appear very stiff but this one literally tumbles out of the frame. Dimensions are 13" x 17-1/2" (sight) . . . add another inch all around for the frame. Lovely!